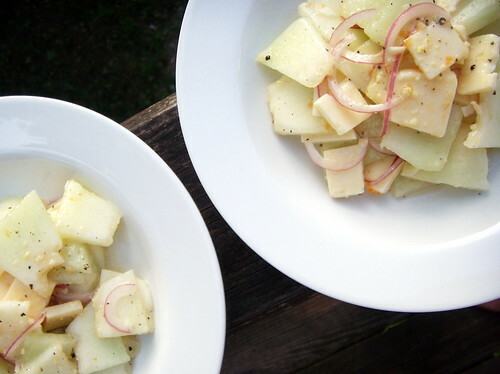 honeydew melon and extra sharp white cheddar salad, originally uploaded by aarn! +21st August, 2008+. was thinking of making a watermelon and feta salad, but then realized that there was honeydew and a nice sharp wisconsin white cheddar in the refrigerator. sliced up some delicious almost-overripe honeydew melon and cheddar cheese, tossed with some salt, fresh cracked pepper, and some very thinly sliced red onion. made kind of a glaze/dressing for the salad with a spoonful of apricot jam and cashew butter, a splash of the hot vinegar (see 8/4:"vinegar base hot sauce experiment", have since strained out the chunks of organic matter and seeds, and it left a nice hot and tasty vinegar), some rice vinegar, a splash of canola oil, and a splash of lemonade (lemon juice would have been ideal, lemonade was on hand), and whisked it up into a kind of vinaigrette mixture. Cool combination. I'll have to try this, I love watermelon and feta salads.